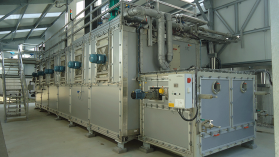 In most cases, the drying units described in the foregoing have been designed to produce dried product with a final dryness equal to or better than 90%. There are a few specific cases where a lower dry solids content is required (often in the region of 65%). Indeed, at this dry solids content, dried sludge has a net calorific value equivalent to that of household waste. Some projects are emerging along these lines, especially when new household waste incineration units are developed and the departmental waste disposal plan can incorporate this co-incineration method and, therefore, the design of a household waste incineration furnace that has the necessary excess capacity. Of the dryers that have already been described only Evaporis™ LE and Evaporis™ LT, as well as most belt dryers and thin layer dryers, are capable of producing this intermediate dry solids content. None of the others are capable of producing a 65% dry solids content unless the 90% dried sludge is re-mixed with sludge that has only been dewatered. However, this approach results in handling and operating problems. If the intermediary dry content is low, e.g. to achieve heat self-sufficiency in a purposely designed sludge furnace, then a dry content of 30 to 45% may be enough depending upon whether or not digestion takes place. 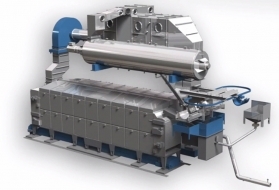 In this case, thin layer type dryers or disc dryers may be used without intensive recirculation of a portion of the dried sludge. In France, energy available from sunlight varies between 1,200 and 1,750 kWh·m–2·annum–1, of which 40% is emitted within the visible spectrum and 50% in the infrared spectrum. The glasshouse effect is based on the fact that materials used for a long time by glasshouse manufacturers (glass, Plexiglas, plastic films, polycarbonate…) have very different properties in both spectra: they are transparent to sunlight but absorb infrared radiation (figure 19). 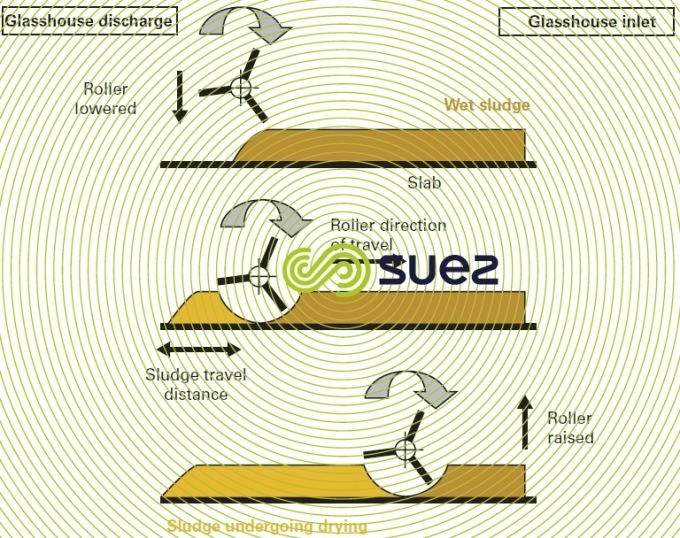 The Héliantis glasshouse uses this widely known principle to accelerate the removal of water contained in dewatered sludge. 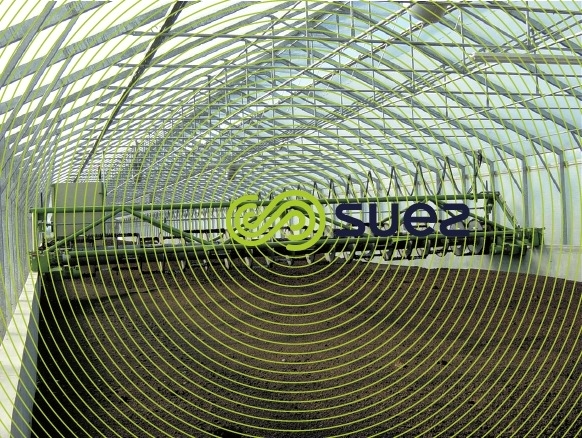 For this purpose, the sludge to be dried is spread and a harrowing machine is used to introduce this sludge into the glasshouse. 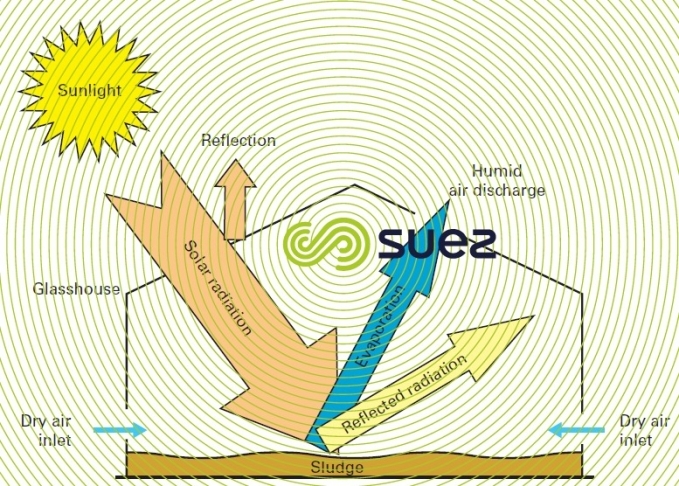 Solar radiation and infrared radiation emitted by the glasshouse’s transparent material heat the surface of the sludge layer and increase the pressure of the water vapor contained in the sludge. A stream of fresh air sweeps across the surface of the layer of sludge and absorbs the humidity. Indeed, air becomes lighter when it is humid and warmer. Temperature differentials combined with density differentials create a natural convection motion that can be enhanced by forced convection (mechanical ventilation). The air in the glasshouse is continuously renewed ("drying environment"), promoting hygrometry that is favourable to optimised evaporation. gradually move the increasingly dry sludge from one end to the other of the glasshouse, without the use of any other devices. In France, it is, therefore, possible to evaporate between 600 and 1,200 kg water·m–2·annum–1 depending on the region concerned. The machine's rate of advance, the drum’s speed of rotation and the depth of penetration into the sludge layer can all be adjusted. Its operation is automated and, therefore, requires no permanent monitoring. The dried sludge takes the form of 1 to 4 cm diameter granules (photo 13). It is easy to handle, store and spread. 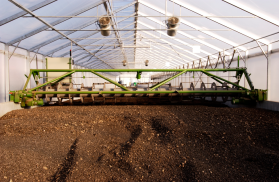 Héliantis glasshouses produce granules that have a better than 70% dry solids content. If required, the glasshouse can be extended by a storage area pending the optimum timing for using the dried product on agricultural land. 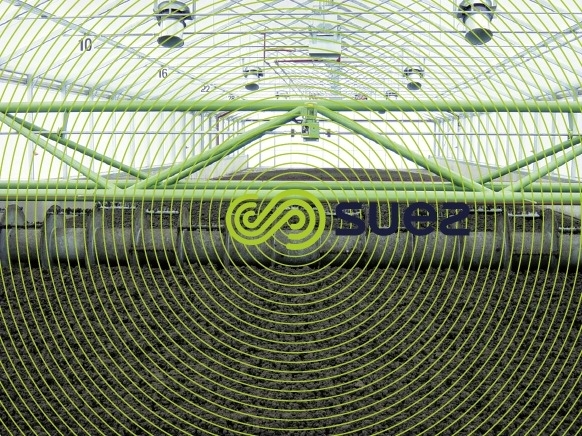 This product can be spread using normal agricultural equipment and with little adaptation. As in the case of all other dried products, it can be used in co-incineration. local specific features (buildings, trees, layout direction…).